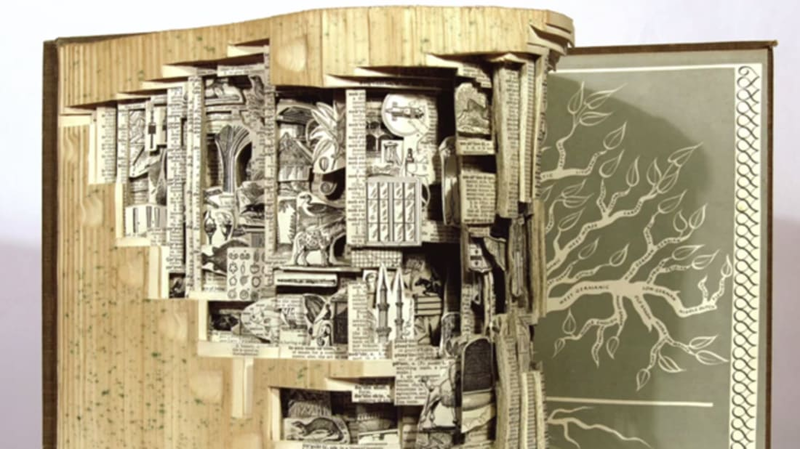 We all know complex worlds exist within the pages of books, but New York artist Brian Dettmer takes that idea a few steps further, literally carving intricate designs into books to create amazing pieces of art. Dettmer makes the sculptures with X-Acto knives, and uses clamps, ropes, and weights to shape them into entirely new forms. He varnishes the books and then slices into them, where the pages are intact under the surface. Nothing within the text is moved, so everything you see in the art is exactly where it was to begin with. In a talk for TED Youth last year, Dettmer described his process as a “remix” because he’s working with someone else’s art in the way a DJ reworks a piece of music. He said he thinks of the book as a living thing with potential to continue to grow, a body, a technology, a tool, a machine, and a landscape. The work also speaks to the loss of the book itself as a medium in a time when new technologies are often the mode through which we read. To see the entire the TED talk, click here, and to see more of Dettmer’s pieces, click here.